Hometown: I come from an average size city in Northern Poland. Name won’t ring a bell to anybody. How did you find out about Vagabonding, and how did you find it useful before and during the trip? As far as I remember some friend of mine shared one of the Vagabonding posts on Twitter and that is how I have learned about this great site. I read mainly for inspiration and to learn about other approaches and personal stories of other travelers. I’m on the road for more than 6 years but I have been coming back home every now and than. Family and friends are very important to me. I always make them my priority, even if it means coming back for a wedding from my beloved Iran or sticking around Europe for few months due to previous arrangements. Almost all continents, but my favorite destinations are Africa, Central Asia and Middle East. Places like Iran, Benin, Oman, Azerbaijan and Kazakhstan. My biggest dreams, which are still yet to come, are Pakistan and Madagascar! I’m educated to be a lawyer and worked in my profession before quitting to travel the world. I have been lucky enough to invest my money smartly and being able to found my travels out of annual dividends. It is not a fortune, but as I do not have any obligations like house payments, car insurance etc… I can spend everything for my travels! 3 years ago I have started my travel blog and so far it was my only work. I have volunteered on several occasions, unfortunately only for a week here and a week there. I would love to settle somewhere for longer and work as a volunteer, preferably in some micro projects foundation and awareness growing campaigns in Africa. If I have to point fingers I would say Egypt. It was my least favourite place due to terrible attitude of Egyptian men to Western women. I’m not sure if it can be considered a travel gear but I must say a scarf! It takes very little place in my bag and it saved my life more than few times. It sparkle your style, it can protect you from sun, rain, wind and cold. It is very useful in religious countries when you have to cover to visit mosques, churches and synagogues. I even clean my camera lens with it, I know it is not very ‘professional photographer attitude’ but what can you do when your lens is in need of some cleaning after few hours on the bumpy dirt road. Total immersion in other cultures, cuisines and landscapes! Getting to see and experiences what others only read about in National Geographic. Learning, observing, gaining a bigger understanding and appreciation for a world at large and little things back at home. Family and friends. They always take the biggest hit. You are almost never present in the most important moments of their lives. I myself try to make an effort (come back for weddings, special occasions and events) but it is not always possible. I have learned not to put anything till tomorrow and to live my life to the fullest. To enjoy little things and to have fun. Actually definition of ‘vagabonding’ never changed for me. For me it was always about wondering, observing and learning about different cultures. If there were one thing you could have told yourself before the trip, what would it be? Always indulge in your craziness Marysia. Pack your smile, common sense and go! Use your time well, it is not a rehearsal, there is no second chance. I hope it will be first half of the year 2015 I would love to go and travel through all countries of Central America. Fingers crossed! 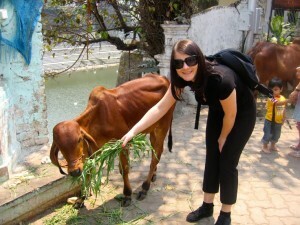 Read more about Marysia on her blog, My Travel Affairs , or follow her on Facebook and Twitter.